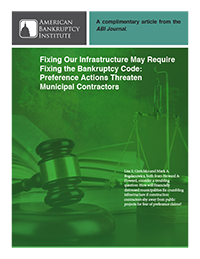 Lisa S. Gretchko and Mark A. Bogdanowicz, both from Howard & Howard, consider a troubling question: How will financially distressed municipalities fix crumbling infrastructure if construction contractors shy away from public projects for fear of preference claims? Want to learn more? Simply fill out the form to the right and we'll send your requested content by email.